Web Pros: Could ExpressionEngine Be Your Next CMS? The Vim text editor is not the only piece of ancient software still popular today. After all, Microsoft Word was first released in 1983, a full eight years before Vim. But today's Word bears little resemblance to its original version, while text editor Vim looks and feels almost the same. And yet, Vim has a vibrant community of developers and evangelists working to keep it alive and kicking, with projects like the game Vim Adventures to bring new users into the fold. Vim is indispensable once you've learned it, and Vim Adventures makes the learning more fun. Currently in prototype form, the Vim Adventures game teaches you to use Vim's unique keystrokes. Right now only two levels are available for free play, and both focus on cursor movement. The first teaches the essential hjkl keys for moving left, down, up, and right. The second lesson has you jumping between words with e, w, and several other keys. 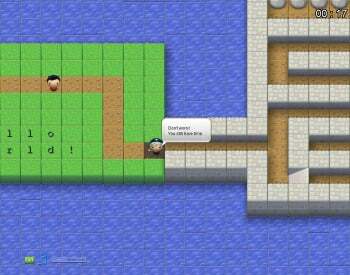 The game itself is a retro-looking tile maze, implemented in HTML 5 (so no Flash is required to play). You're not really a character: Whatever tile you're currently standing on just blinks, a bit like the caret in a text editor. At the beginning of the first level, Vim Adventures shows you what hjkl do. You then need to use those keys to successfully navigate a tricky maze. As you move through it, you need to collect keys, backtrack, cross one-way passages, and more. And if you don't make it through the maze in 45 seconds, Vim Adventures teleports you back to the beginning. This is frustrating, but it also ensures that by the time you make it to the end of the level, you have some muscle memory for hjkl movements. Vim Adventures took me about ten minutes from start to finish, and serves as a nice introduction for Vim's unique motion keys. Rounded out with more levels, it can become an excellent way to master Vim basics.